I’ve finished processing the southern hemisphere GHCN data, and computed the temperature according to the simple procedure for the entire globe. As stated before, contrary to the claims of D’Aleo and Watts, station dropout did NOT introduce a warming trend. If anything, it introduced a cooling trend. Will Watts wail with wondrous woe ? Or will he ignore this and move onto his next piece of dodgy deception ? I don’t. Oh, wait, was that a rhetorical question? I used to respect Watts. I used to think he was someone who was working to improve the science. Then I learned enough climate science and statistics, processed the data myself enough times, to realize that he was either a) ignorant of the science and data or b) he was lying. Given Watts’ response (or lack thereof) to the Menne paper, Tamino’s analysis, plus a whole slew of bad arguments and wrong science that Watts’ acolytes have made at my blog over the last few years, the preponderance of evidence at this point is that option b) is the correct one. Although I generally believe that professionalism in science is when we publicly stand by our name and credibility, we can be fairly certain that this will be Anthony Watts’ response. Refuse to rebut the substance of the post – go directly to ad hominem. So Smith discovered that some high latitude areas are undersampled and only “speculated” about the warming bias! How convenient! These guys are dishonest, stupid, or both. And better educated septics didn’t have the balls to tell Anthony that he was flatly wrong. 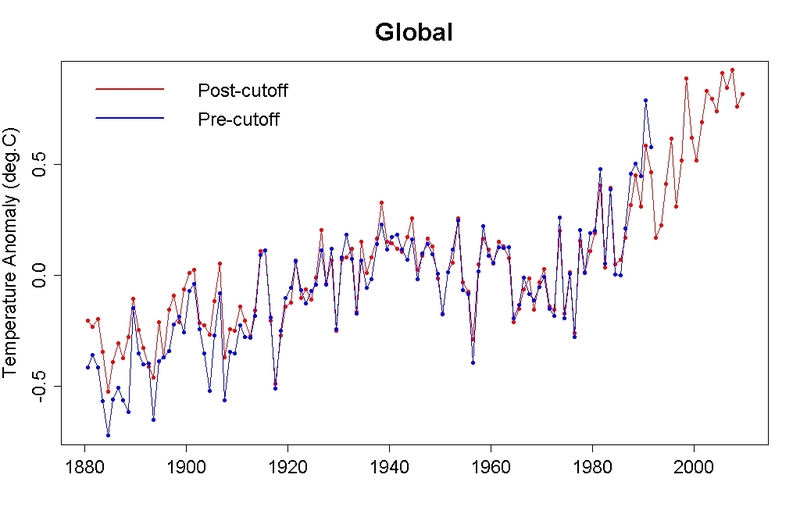 These data were then used to determine the global average temperature and to initialize climate models. Clearly they have no clue how climate models are spun up. Not surprised. Would it be over the line to suggest WTFgate? Er, yes, it probably would. 2009 12 0.288 0.329 0.246 0.510 31. 0.260 0.306 0.214 0.201 365. 2010 1 0.724 0.841 0.607 0.757 31. 0.296 0.339 0.252 0.269 365.
hmm, new version loosing a whole 0.1C and some wordspiel, the venerable Wattus being reffed as the person to point out the peculiarity? Roy Spencer says that their adjustments to the raw data have changed to reduce seasonal variability (apparently the RSS set had substantially less). I don’t know of any physical reason for this change in treatment of the data but it doesn’t change the overall UAH trend. You have to look at the newest post (not just the “Latest Temperature” page to find comparisons between the old/new versions and his explanation. Does the seasonal adjustment address Tamino’s point from a while back? Attribution of why the change was made, well GFB, if that would go to someone in the It’s True and verified science camp. I copied the comments from WUWT where I pointed out this error to Anthony Watts, and he “discovered” this trend. I linked to Deep Climate. The comments included a comment from Deep Climate giving proper credit for discovering the seasonal UAH trend. I can’t put it all in a comment, but if you pop me an email, I will send you a text file containing the comments from last July. It is incredibly amusing, yet discouraging reading. AW went on and on about the evils of adjusting reported data later on. He does seem to keep correcting his data, and January did go down in the latest round. January and February still very high, though. For the record: Below is the table I find on his homepage right now, including February data. I don’t think we need to attribute nefarious motives to the corrections. Satellite data are VERY difficult to interpret and require lots of corrections. For one thing, the orbit is changing continually for any satellite in low-Earth orbit (LEO). 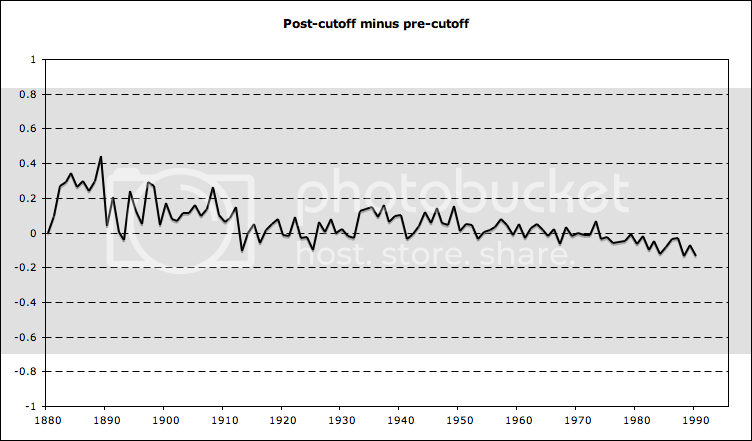 This is one reason why I tend to believe the terrestrial record more–that and the longer baseline. Deepclimate explored some of the strange seasonal anomalies in the UAH product a few months ago. It looks like UAH is correcting that problem since Jan/Feb were showing strangely high anomalies every year. Here’s Deepclimate’s second post on the subject. I got interested in the subject because of a couple of posts that Tamino had done previously on the severe annual cycle in UAH (credit where credit is due). I may have been the first to show that the recent annual cycle led to a correspondingly large divergence in trend slopes by month (which showed about 0.12C/decade difference between February peak trend and May trough). For me and others, I think that made the problem more understandable in practical terms. I had a reasonably civil correspondence with John Christy about it (after Watts brought it to his attention). Christy had just written about the annual cycle last July (in the UAH readme) and acknowledged it needed to be fixed. I’d echo the sentiment that inter-satellite calibration and other adjustments are extremely difficult, and I’d still consider the surface record more reliable and less uncertain than the satellite-derived tropospheric record, whether UAH or RSS. Posted a link to the GHCN post on the Guardian as they had a comment on double standards. Thought this nicely dovetails into that comment piece, hope the mods dont delete it. Sorry OT but didn’t know where to put this one. Looking at the current volcanic activity in Iceland I was drawn to my bookshelf in order to get reacquainted with the literature on the Laki (Skaftar Fires) eruption in 1783. I’m glad, because what I found suggests that there is some potential for an interesting summer [and winter] ahead. An abnormal temperature decline began in Autumn 1783, hitting rock bottom between December and February 1784, when th elowest ever winter average temperature for this region [Eastern US] was recorded ; 4.8C below the 225 year mean…The bitter winter followed an uncommonly hot summer for various parts of the northern hemisphere. For instance, July 1783 is the warmest on record (at 18.8C) in central England except for 1983 (the average July monthly temp for all years 1659-2001 in this record is 15.9C) [NB. not sure that this still stands given the book’s publication date]. What is more, the heat wave across Europe coincided with fumigation of the lower atmosphere by Laki’s aerosol. The subsequent picture is less clear. 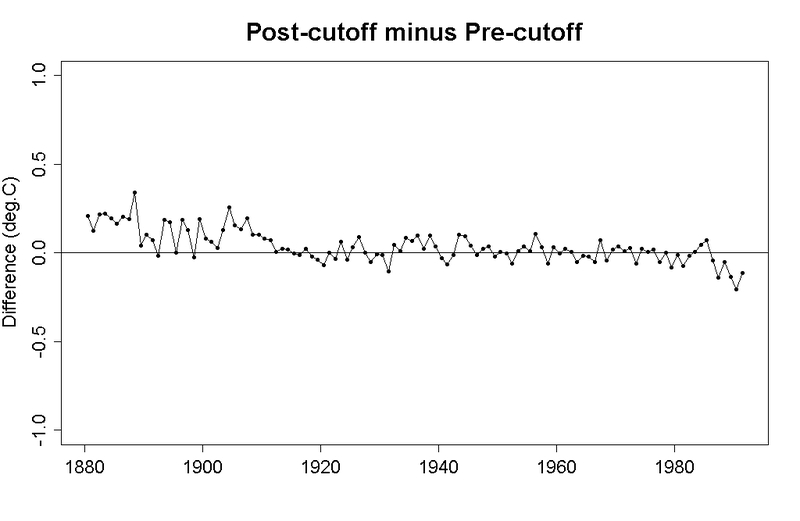 Thordarson and Self found that the European summers of 1784, 1785 and 1786 were colder than normal, but tree-ring chronologies record a warm summer in 1784. Needless to say, I’m watching the migration of the current eruption fissure quite intently. NASA say that eruptions need to be close to the equator and also emit huge quantities of SO2 in order for them to have a significant impact on climate. Laki was unusual in that it wasn’t a huge quantity of SO2, it was a VAST quantity of SO2 over many months. One (unreliable) source puts it at “equivalent to a Mount Pinatubo-1991 eruption every three days” – for 8 months! If Eyjafjallajökull was emitting anything remotely close to this, then I hope we would have heard about it already. That sort of quantity is just plain toxic over a very wide area. Tamino, it’s been a while since you posted this, but did you compare raw v adjustments for global, too – as you did with NH temps? What was the result?